Did you find the fabric of your dreams? Great! 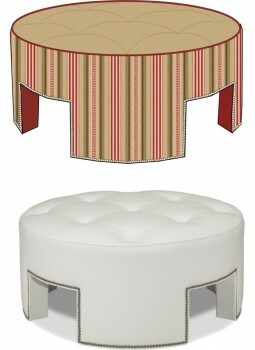 The Kristin Drohan Collection is delighted to use your material to cover your custom furnishings. Please feel free to inquire about custom dimensions or options you’d like to have. We have lots of flexibility and we would be happy to price it out for you. Please look over the following guidelines to make sure your order goes as smoothly as possible. If you would like to show your client what your Customers’ Own Material (COM) looks like on one of our pieces we can render it for you. Just send us a jpeg of your fabric or fabrics with instructions for placement. We can turn it around in 48 hours. Please call 978-254-5868 for pricing. Orders may not be canceled once a piece is in production. Changes or alterations are subject to approval, depending upon the production status of the order. Please call the factory to check the status of your order before speaking with your customer. To expedite COM orders, please download our COM Specification form. Please make copies of this form to use with your COM orders to ensure that your fabric is applied properly. We encourage you to please fill out a form for each piece of furniture ordered. Attach a sample of the fabric showing which side to apply face up; we have a space on the form where this swatch can be attached. If there is not a COM Specification form attached to your order, we reserve the right to use our best judgment in the placement of the fabric. Excess fabric will be returned when requested with the original order. When shipping multiple fabrics to our production facility, please include your name and the customer’s name on each shipping label, use a COM Spec sheet for each fabric/piece and clearly indicate where each fabric is to be used. Fabric welt trim will be used on COM orders unless other options are specifically requested on the original order form. Unless the style normally uses a nailhead trim, we WILL NOT APPLY NAILS if not specified on the original order. Yardage estimates are included in the price list and are based on 54″ wide fabrics with the following repeats: Plain; 1″-14″; 15″ & Over. In some situations, due to unusual repeats or design characteristics, additional yardage will be required. We will advise you as soon as possible if additional yardage is needed. Contrasting welt will be placed in welt locations standard for the piece unless specified on the COM Specification form. Typically, yardage requirements for COM welt are as follows. Unique styles and details may alter these amounts. Location of COM welt, fringe and other decorative trims must be specified on the COM Spec form. Actual yardage requirements will vary according to their placement. Please call for help in calculating yardage requirements. Upcharges for COM Fringe & Trim: Please call for upcharge.